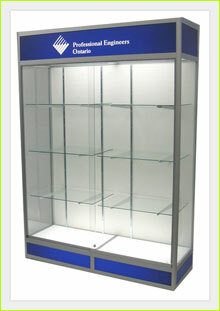 We manufacture custom glass showcases and glass display cases in any shape, size or color. Custom Showcases is the designer and producer of elegant, yet solidly built custom designed glass showcases and glass display cases. Custom Showcases was established in North America in 1985 and in Europe more than 30 years ago. The company is family-owned and operates out of Ontario, Canada. Royal Doulton, Swarovski, Tiffany & Co., Sotheby's Auction House, F.A.O. Schwartz 5th Avenue, NC Cameron & Sons (division of Enesco), Jaguar, Rolls Royce, IBM, the Hudson Bay Company, The Royal Canadian Mint, CBC (The Canadian Broadcast Corporation), Eaton's, Sears, Canadian Space Agency, Canadian Food Inspection Agency, Ricoh Canada Inc., Kraft, Bell Mobility, Glaxo SmithKline Inc., Grainger, Price Waterhouse Coopers, University of Toronto, York University, Government of the North West Territories, Fidelity Investments Canada, Sandia National Laboratories, Cryovac Inc., Olympic Honda, Western Québec School Board, York Region District School Board, Corus Entertainment, City of Hamilton, etc. Our Aluminum Extrusion System makes our glass showcases and glass display cases sturdy and extremely durable. That is why the largest exhibit and rental companies in Canada and the USA choose our high-end showcases and display cases. Our range of colors, finishes, and lighting options is extensive. The aluminum frames can be anodized or powder-coated in a wide range of finishes and we can use nearly all laminates on the market today. Also available are different kinds of showcase and display case locking systems. Simply put: our showcases and display cases are considered by many to be the best in the industry.